An excellent new military band CD of Sullivan's music has just been issued: "The Lost Chord" SRC 106 (full price). SRC (Specialist Recording Company) is a newly formed company whose aim is to record military band music to the highest possible standards. This disc is their fourth: so far each has been devoted to a single composer (the three already featured are Elgar, Bliss and Malcolm Arnold). 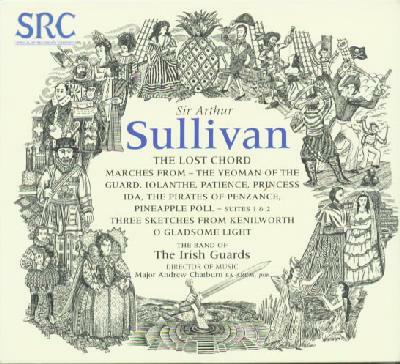 The Sullivan disc features the Band of the Irish Guards conducted by Major Andrew Chatburn in 20 items: "March of the Peers" and Iolanthe overture; parade ground marches from Patience, Pirates, Ida, Yeomen [regrettably misspelled YeomAn on the sleeve]; first and second suites from Pineapple Poll; "The Lost Chord"; "O Gladsome Light" (The Golden Legend); Princess of Wales' March; three sketches from Kenilworth. As will be seen, the programme ranges from the very familiar to the (almost) unbelievably obscure, and some of the familiar is presented in slightly unfamiliar form. The parade ground marches of G&S appear not to have been played for 50-odd years and are fascinating little studies, not least for their content. The big rarities are the three Kenilworth sketches, arranged by Herman Finck and transcribed for military band as recently as 1937. The playing throughout is splendid, with great sensitivity in the slower numbers, particularly "The Lost Chord" and "O Gladsome Light," and plenty of vivacity elsewhere. Perhaps the Iolanthe overture is a little slow, but only a little. The disc is attractively presented in a box unlike the familiar "jewel box": the back part, which holds the CD, is plastic; the front is 3-fold glossy card on which are printed the notes and illustrations. There are background notes on military band music, the band, its conductor and soloist, and on Sullivan. There are a few errors, but nothing of major proportions. The worst is probably the statement that "The Lost Chord" was composed after Frederic Sullivan's death, whereas we now know it was completed prior to it. There have been a number of military band LPs and CDs devoted exclusively to Sullivan over the years, most recently the valuable Kneller Hall Sullivan Salute of 1992, which contains a number of rarities, and the Band of the Royal Marines' The Music of Gilbert and Sullivan (1998), on which some undistinguished amateur singing detracts from fine playing of familiar repertoire. But its combination of a genuinely interesting, well balanced programme and outstanding playing makes this new disc the benchmark against which all future entrants in the field must be measured. Highly recommended. The disc is available from the Sir Arthur Sullivan Society's Sales Officer, Peter Gibbons — GBP 12 in UK; GBP 14 / $22 overseas (airmail). Peter Gibbons, 71 Hockley Lane, Eastern Green, Coventry, CV5 7FS, UK. Please make cheques payable to Sir Arthur Sullivan Society.